Not all Arab states felt comfortable with the Saudi-led airstrikes targeting the Shia militants in Yemen after the latter began controlling the southern city of Aden. Iraq has publicly revealed their concerns over the military intervention in Yemen during the Arab League summit held in Egypt's Red Sea resort of Sharm El-Sheikh on the weekend. The Iraqi Foreign minister explains, in an interview with Al-Ahram Hebdo, why Baghdad isn't in favor of a foreign intervention in Yemen, and the reasons he encourages it in Iraq, as well as the Iraqi position on the joint Arab force. Ahram Hebdo: Iraq said it is opposed to the military operation launched by the Arab countries in Yemen, why? 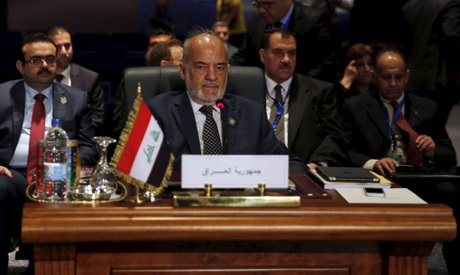 Ibrahim Al-Jaafari: Yes, we are against this military intervention. We do not agree with the logic of war and interference in the internal affairs of states, whether it is Yemen or elsewhere. We think that the political solution, not the military one, has to be the basis of solving problems. And we think this situation is neither in the interest of Yemen, nor the Arab countries. AH: But there is a foreign intervention led by the Americans that operates in Iraq against the Islamic State group. Is this not a contradiction, regarding the position of Baghdad? AJ: The situation is different. In Yemen, the Houthis are an integral part of the society, but members of the Islamic State group in Iraq are not Iraqis. They are of different nationalities and have come from different parts of the world- from the ex-Soviet Union, Australia, Canada, France, Great Britain. And there are 62 countries that reject this movement. Hence, we have called upon the coalition countries to save us from the Islamic State group, and not from a crowd of protesting Iraqis. As for these foreign forces that operate in Iraq, we have obliged them not to install any bases and not to target civilian installations, but only targets that are fixated by the Iraqi armed forces. Today, all the social categories in Iraq are represented in the parliament and in the government. This is why when we say that we reject foreign intervention, we think the situation in Yemen is quite different. Houthis are Yemenis in the end and are not intruders like the Islamic State group. AH: Have you raised this issue at the summit with Saudi officials? AJ: We are amongst the seven founders of the Arab League and we support it, no matter what the circumstances. We have expressed our point of view freely during the discussions at the summit, but we haven’t met with the Saudis tete-a-tete. AH: Are you also opposed to the creation of a joint military force? AJ: We haven’t rejected it, we only voiced some reservations. There should have been more ample consultations before announcing the project in order to elaborate on the specific strategies of the force. The Iraqi army, one of the oldest in the region, with its capacities and experience, which participated in three wars, should have been consulted better. The idea is good, it is a courageous initiative that reflects awareness of the dangers that await the Arab countries. However, transparent bilateral consultations should have happened in order to transform this initiative into a military agreement. AH: Has the Arab-Iranian conflict become a priority for the Arab League today? AJ: I would say that it is an Arab-Arab conflict. The Arab countries, instead of getting even closer to each other, have opened a new page of war, while we need to spread peace now more than ever. And I hope the Arab League will be up to the responsibility. *This interview was first published by Ahram Hebdo. This person wherever he came from is contradicting himself. Yemen's issue has the same objective as in Iraq, Libya, Syria, etc.. however different technics are used for each nation but with the same exact goal, 'division of sovereign nations'. The commonality between the said countries is that they all experience foreign meddling for division into micro countries. Regardless of whether they are on the ground (like DAESH in Syria) or endlessly supplying warfare equipment (like Iran in Yemen) you are achieving the same goal which is creating a breeding ground for more chaos and that FM is supporting just that. He knows that the Arab coalition is trying to prevent that division but his motives of friction to cooperate with Arab League member states are quite clear.